Linja is one of the small games from our Essen loot stack. Developed by Steffen Mühlhäuser and published in his own independent publishing company, it comes from a stable of little, texture-friendly two-player games. Like its siblings, it offers nice and lasting diversion on a small set of rules. 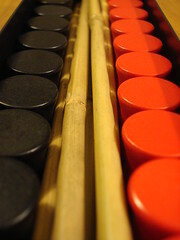 A very handy slim box contains the game materials, consisting of seven reed sticks and twenty-four wooden meeples – twelve apiece in red and black. Setting up the game is easy: place the sticks in a parallel alignment on any somewhat flat surface (at the fair, the presentation tables were equipped with a felt surface, which was ideal), spaced to accommodate a row of meoples between them, oriented to create a zebra crossing between the players. Now you place six of your meople in front of you, outside the first stick, and the remaining meople one each in the gaps between the sticks, preferably aligned to one side. Your counterpart proceeds likewise to complete the basic set-up, looking a bit like a football-field / gridiron. Linja playing mechanics can be best described in a classic two-step model. The player starts his/her turn by moving one meeple of their choice forward one gap, i.e. across exactly one stick. Now the player has a second step with one of their meeple, the distance he is allowed to go is determined by the initial move: the number of meeple (both colours combined) already in the row your first move ends in (so: not counting the meeple you move in) equals the number of rows your second meeple moves forward. So, the more crowded a row the more movement you get for your second step, and you are free to move any meeple here, including the one you moved before. You are, however, obliged to cover the entire amount of gaps you get in your second move, unless you were to exceed the goal row (behind the final stick), in which case your meeple ends there. The game ends as soon as the colours have entirely cleared each other, so you have no meeple behind or on the same row as your opponent’s last meople. Scoring then proceeds by counting your meeples’ progress, with five points scored for each meeple on the goal row, and decreasing scores for meeple on the previous rows. 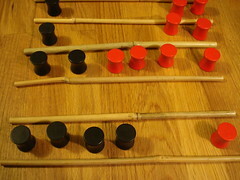 There are a few additional rules to add some strategic depth to the game: Firstly, there is a limit of six meeple for each row (except for the home/goal row) of both colours combined; this means you cannot finish either step on a row that already has six meople, and your second step can therefore never exceed five paces. If you were to terminate either of your two moves on a full row, the move is not possible. Secondly, the goal rows are different in that ending your first step there always gives you a second step of exactly one, regardless of its current population. And finally – and maybe most importantly – there is a chance to be cheeky and grab an extra turn (i.e. a complete two-step). To do so, you need to terminate your second move on an empty row. This stresses (a) that you are bound to use all the moves you have when moving your second meeple, and (b) that it is advisable to be very careful with clearing rows of your meeple completely. To limit the power of such extra moves, each player can only get this additional turn once in succession (in order not to create an endless turn). Linja is pleasantly simple to learn and still offers some nice gaming fun. It enables you to ‘just sit down and play’ just as well as it allows you to do some strategic pre-planning. However, since your movement options are somewhat limited, so is the ability to apply elaborate schemes, and you will not find yourself immersing into it like Hive or some of the games from the Gigamic tribe (e.g. Quarto or Quoridor). But speaking of these, there are some pleasant similarities, primarily the very nice texture and quality of the game elements of natural materials. Also, like the Gigamic games, Linja utilizes a very simple rule body to create an appealing little game that doesn’t threaten to bore you quickly. It may not be an occupation for a whole evening, but due to its short set-up and playing time more than aptly works as a filler. Its simplicity may also be one of its commercial weakness, though, as any set of 2×11 pieces (coins etc.) and a basic-structures surface combined with an understanding of the rules allows you to play Linja without buying the actual game and not feel like it is entirely makeshift. But of course we strongly recommend to buy the game, and experience the original linjearity.